Super cool. Glad to see that the sediment was stuck in the sump not something else awful. I am very impressed with your progress. Are you going to push to get it registered and tagged, then go back through the car? I would have pulled the carpet our the first day, so I was just curious. ...Are you going to push to get it registered and tagged, then go back through the car? I would have pulled the carpet our the first day, so I was just curious. Yes, I want to get it established as a driveable car. When I saw all the water drain out of the engine I became pretty concerned - that was a lot of water in there for a long time. The engine alone is worth the total of what I spent on the car. Once I have it tagged, I can drive it for a few days to make sure the engine is stable. Then I'll probably revert my insurance status to "stored/inop" and dig in deeper to the rest of the car. Sounds like a good plan. Thanks for taking the time to document and share this. I am sure a lot of us have thought about picking up a flooded vehicle but have not jumped off the deep end. BTW: my wife would kill me if our driveway had that many cars! Would it be worth it to send the oil out out for an analysis? I know the results can be pretty specific. Great work by the way. Hopefully you dodged a bullit. Thanks... Yes, that's a great idea. I've never done it, but I search BITOG often when comparing oils and love to look over the UOAs and VOAs. I'll probably have to put some miles on to get a decent sample though. To the others who think that buying a flood car is a good idea... Maybe, but be very careful. I have boxes full of parts I've gathered and I have been working on these specific cars for almost 4 years now. 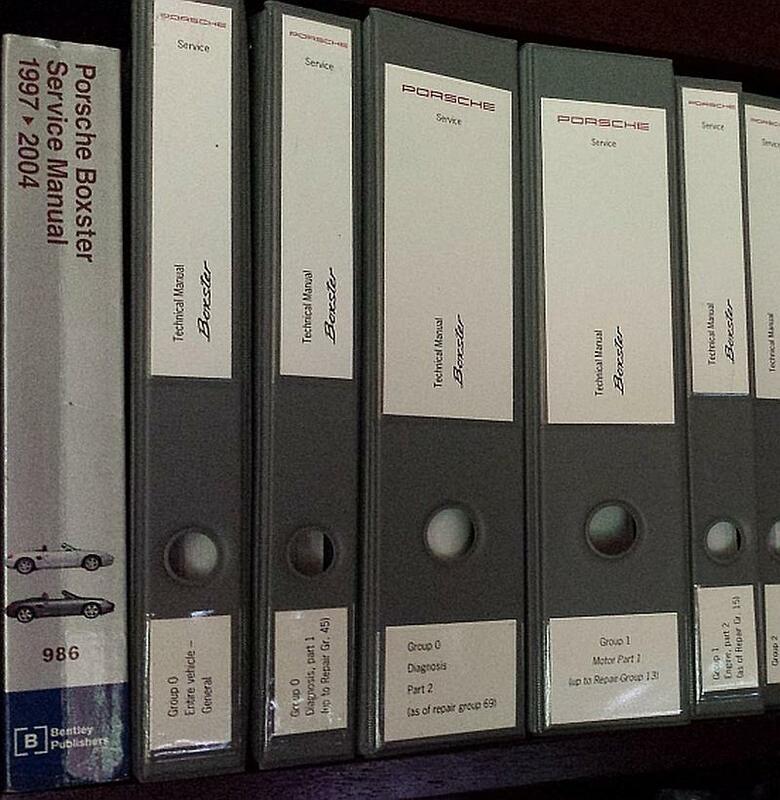 I also have the 16 volume (loose leaf binders) shop manual from Porsche. ...one of the best Craigslist snags I've ever had. I am not particularly good at this stuff or full of optimistic energy. It's really more of a faithful perseverance, expecting that things are going to go wrong, but knowing I'll find a way through. Knowledge is power. As the saying goes hope for the best, prepare for the worst. I enjoy Lazarus projects. 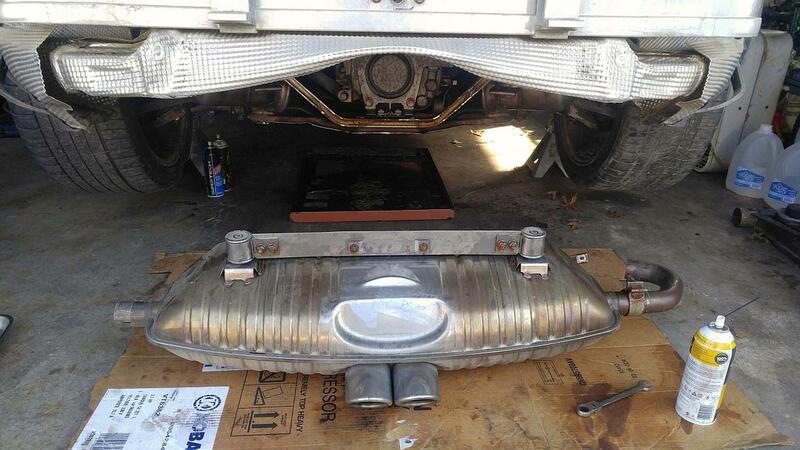 The rear bumper and tail pipe claim – I did my own estimate for repairs and had my wife contact the shipping company. They agreed to my figure, out of pocket from the driver rather than through insurance. I am still waiting for the money. I think I'll repair the bumper myself, and if the result isn't satisfactory, take it to the shop after. I have a decent spray set-up and a bumper is a lot easier than a whole car. The Original muffler has a lot of water trapped, and it will take a long time to get it all out. Rather than deal with that now, I installed another S muffler with the two round tail pipes. Future? Maybe buy the SE tail pipe, or maybe get a lighter aftermarket exhaust. I'm working through some of the electrical issues now. Most of the electric motors that got wet, failed. The rear spoiler and trunk latch motors have been replaced. The SAI blower , the top motor, the HVAC blower; All bad. The passenger side window motor was shorted internally and constantly drawing power. Much of the rest is good. The ABS/PSM was having a code because I forgot to put the PSM fuses in. HVAC control, lighting (except right tail bulbs), instruments, and controls, are all good. All indications are that the airbag system will be good after I install both seats and reset the module. Even the original battery is recharged and working fine so far. The engine is running great. Oil samples look good since cleaning the sump. I took a short drive around the neighborhood. It pulled hard and felt good. I have new rear control arms and drop links ordered and already replaced the broken track arm with one that I had from my parts car. Over the next few days, I'll get the electronics sorted out better, put the interior back in, and get the title and tags done by Friday. Once it is on the road, I'm going to drive it for a few hundred miles and check it out before I pull it apart again for further repairs and cleaning. When I first started buying from Copart, I got some 'practice' with cheap cars that I knew. I had been working on Hondas for years, so i bought an Accord and CR-V that I flipped before buying a Boxster. 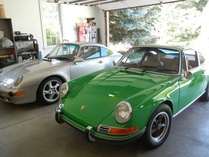 Some of my auction cars have been great and a few have been mistakes. Keep in mind that "Runs and drives" and "donated" still mean that someone decided that it wasn't worth fixing. Parts cars are great if you have the time, space, and energy. I'd suggest buying a wreck to strip as a way of getting started. The engine is running great now. Lots of little things I can start paying attention to now. I put the rest of interior together today. 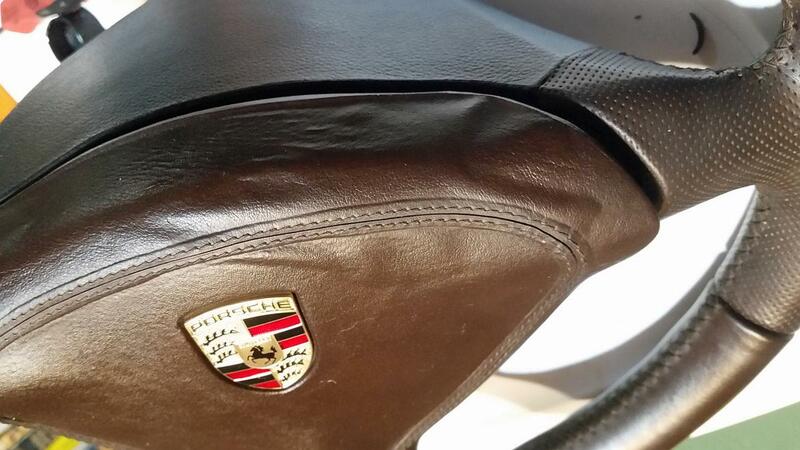 I have an old 4-spoke steering wheel and airbag in until I see about re-affixing some of the leather on the original. The airbag system in the car all checked out good. 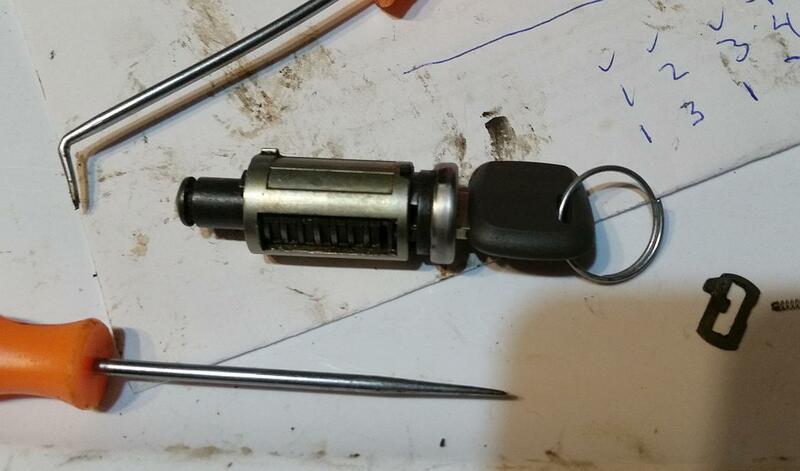 I took the door lock from my old parts car and pulled it apart. It took me some figuring, but I made it match the key that I have for the car. Hopefully I'll get it installed before I lock myself out. 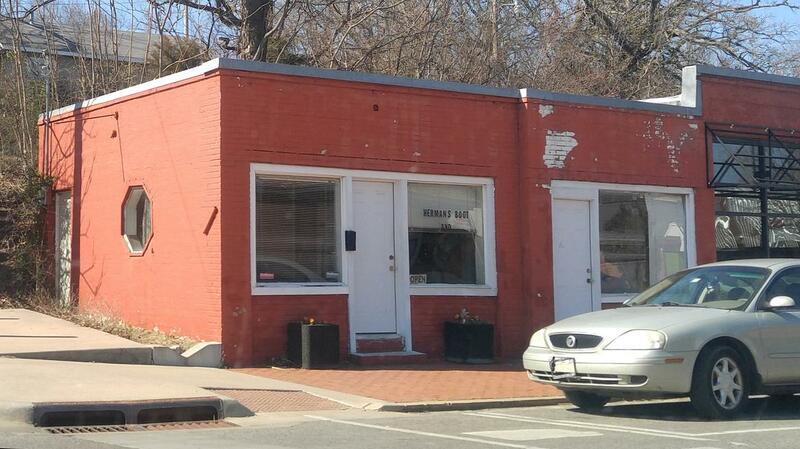 Started insurance on it and drove to the Tag Agency. They said that my Oklahoma Salvage title is in the mail, and I'll have to bring it in to get the rebuilt title. Sounds good, it will probably arrive in tomorrow's mail. While driving it today I got the Check engine light for both secondary O2 sensors and an ABS light for the brake pedal switch not working. I'm expecting these sorts of things and have parts on hand for most of it as they come up. Jeesh. All this mechanical stuff, and a locksmith too. I'm way impressed. Semper Avanti. The car is running great, but I can't drive it anywhere yet. I had thought the Tag Agency was going to hold my title application until I returned to get the rebuilt title, but they went ahead and sent it in for an Oklahoma Salvage title. It usually takes about a week for the new title to arrive, but this one is taking longer. I took care of a few minor issues, but I don't want to do anything major until after I put some miles on it. I replaced the secondary O2 sensors and air injection pump, cleaned and lubed the brake light switch, then installed the matched lock tumbler in the door. Everything was smooth and easy except the lock tumbler. I had to remove the door latch assembly from the inside of the door to get the old lock tumbler out. It's a kind of tight fit for big hands. While trying to pull the lock mechanism out, I inadvertently held the lock lever to the unlock position, causing the windows to automatically go down (a special feature on the Boxsters). At first, I had no idea why the window was going down, but knew that I could shed a few fingers if the window pressed them against the sharp metal edge of the frame. I barely got my hand out in time and only lost a little skin. I also picked up another parts car. 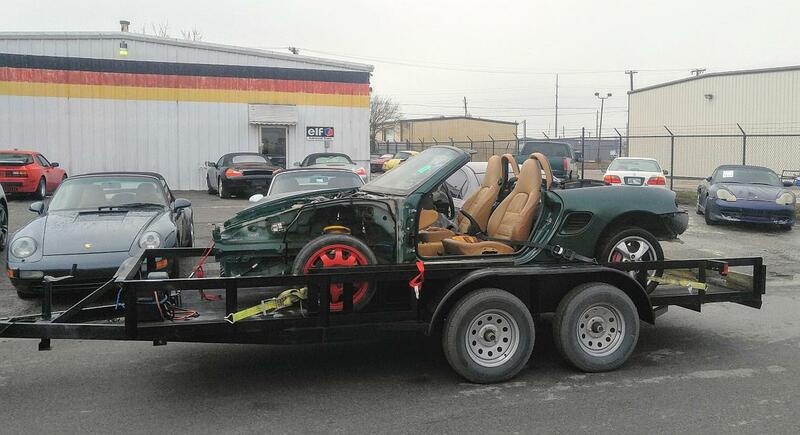 My old parts car is almost completely depleted now and with five Boxsters in the driveway, that was making me feel a little uneasy. I got a good deal on a 2001 S that was partially stripped out. It had no engine, transmission, doors, trunk, top, or hood, but I have most of those parts in storage. My wife went along for the ride and we had a nice visit with Jason, who is also a bit compulsive about buying Boxsters. 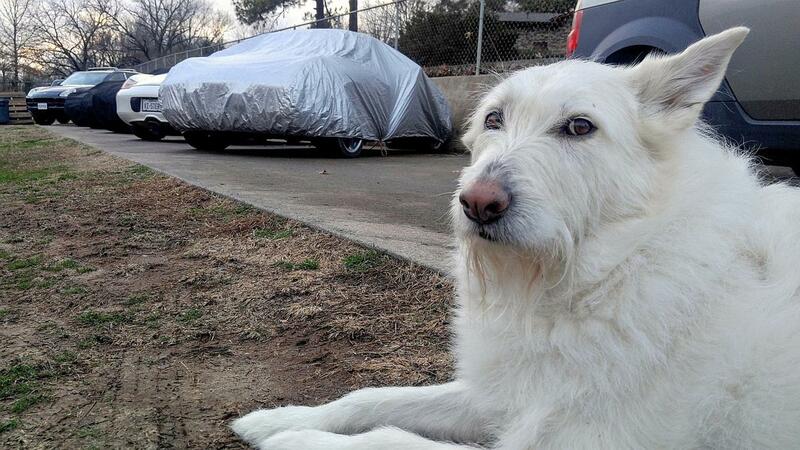 The car is back out of the garage and covered. I start a week of day shifts on Wednesday and really hope to get the title before then. I have plenty of slack time at work, but can't be more than a couple minutes away from my office. If I drive it to work, I can give it a good cleaning and drop it off at the tire shop across the street for a new pair of rear tires. For now, we just sit and wait. Following along! I have been temp[ted by a couple flood cars, but I have heard of nightmares..... Especially with modern electronics. Every time I see this build posted, I know I'm going to open "Man O Mandora's Boxters" build. Beyond my scope, impressive. 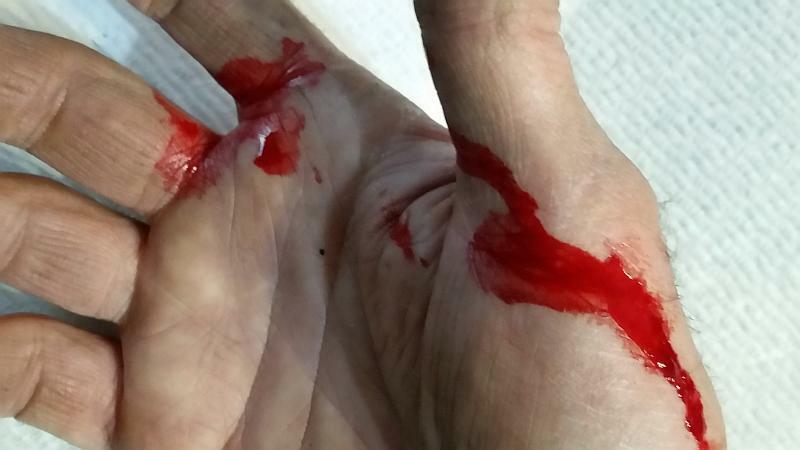 Hands seem to bleed more than they should. Does your parts car have a jack and tools by any chance? Cool project, thanks for bringing us along. I’ve looked at Boxter’s on and off over the years and I’m kind of surprised I haven’t brought one home yet. It’s good to know they multiply like VW Beetle’s, Rabbit’s, Miata’s and Yugo’s. The parts car didn't have the tool kit or jack, but I do have a slightly beat up Boxster jack and most of a tool kit in a corner of my garage. Need anything? I love the old Rabbits, learned to drive in a '71 Beetle, and my wife owned a Yugo when we married (We just left it on the street when we moved), and I almost (but not quite) buy a Miata about once a year. I could see getting any one of those if I ever have room for another car. I have been waiting for the title for about a month now. It normally takes less than a week. Something is wrong. The first time I went to the Tag Agency, I didn't quite hear them right. They told me that the Title would be on hold until I brought the car in to have the VIN and mileage verified. I thought they told me they were going to hold the title until I brought the car back to verify the repairs. So... when I brought the car in to have the repairs verified, they told me that I needed the Oklahoma salvage title first. Instead of looking at the car to verify the VIN, they sent me home to wait for the title – which wasn't going to be sent until they verified the VIN. My wife has said that I'm deaf in my left ear and just don't listen with my right. Today I got the title released and it may be here as early as Friday. Then, finally I can drive the car. I drove it to the Tag Agency today to show them the VIN. I think that I could have been stopped by the police and ticketed for being unregistered. 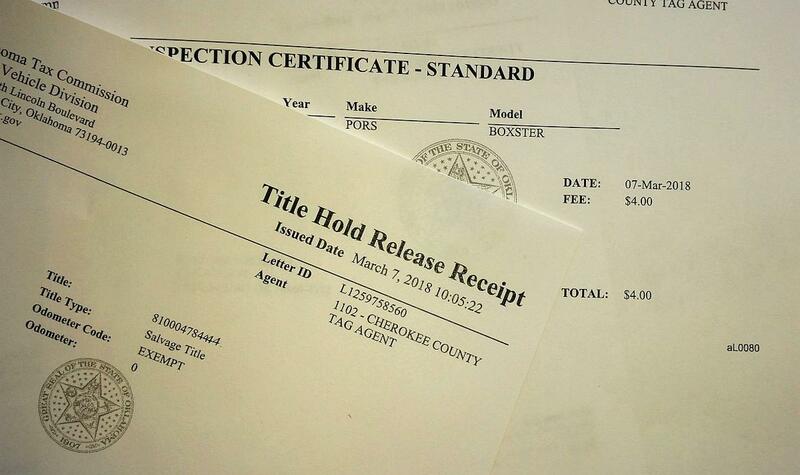 The ticket, noting the VIN of my car and signed by local law enforcement would have also served as documentation to get my title released and I would be fine with that. I took the steering wheel airbag to a local shoe and boot repair shop. This guy has been in the business of leatherwork for many decades. He had plenty of high end cowboy boots to keep busy with and didn't want to take the airbag as a job. He was happy to check it over and had a lot of questions about the car. He told me to come back with a bottle and gave me some of his special glue. Wouldn't let me pay anything. My claim for the damaged bumper and tail pipe is finally paying. I have half the money and expect the rest on Friday. I paid a little over $700 for the shipping and figured my cost to do the repairs myself would be about the same. The shipper decided to pay me directly rather than go through insurance. No doubt the claim could have been well over $1,000 if done through the insurance and he still would have had to pay the deductible. 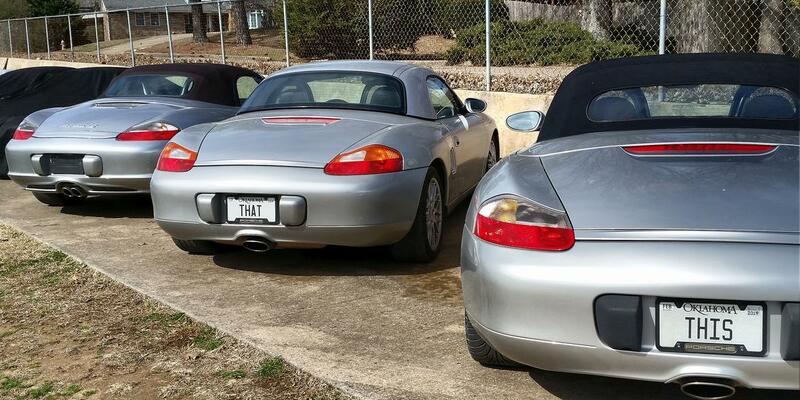 Best pair of license plates ever? Please tell me "OTHER" is going on the third plate.